Since I've enjoyed Pheasant Hunting on and off over the years, I have to admit to wondering just where those pretty birds came from? Many years ago I was told they came from China, but honestly I never really gave it much thought about how they exactly got here from China. In China, which really is a land rich in symbolism and imagery, the Chinese pheasant represented light, virtue, prosperity and good fortune. The pheasant is even part of the Chinese philosophy of seizing prosperity, as the 5th century BC philosopher Lao-Tzu said, "The pheasant which is not seized, will fly. And the farmer will feast on the memory of an empty plate, and the flutter of feathers". As for looking into pheasants, I figure some may find it interesting that the first Chinese ring-necked pheasants introduced into the United States arrive at Port Townsend, Washington in 1881. It's true, the pheasant is a Chinese immigrant to North America first successfully introduced back in 1881. The story goes that on March 13, 1881, around 60 Chinese ring-necked pheasants arrive in Port Townsend aboard the ship Otago. America's consul general to China was Owen Nickerson Denny (1838-1900), he and his wife Gertrude Jane Hall Denny (1837-1933) shipped the pheasants, along with other Chinese birds and plants, from Shanghai China in hopes of establishing a population in their home state of Oregon. While almost all made the trip from China, almost half of the pheasants didn't make the journey from the Olympic Peninsula to Portland. A few survivors were released on the lower Columbia River, but accounts differ as to whether this population survives. However, the Dennys decided to try it again and shipped more pheasants in 1882 and 1884, which successfully introducing ring-necked pheasants into Oregon's Willamette Valley and on Protection Island in Jefferson County near Port Townsend. The colorful game birds prove prolific and popular. Ring-necked pheasants spread throughout Oregon and Washington, and were then introduced in 40 other states across the country. They are so common that they seem more a native species. Both Owen and Gertrude Hall Denny were pioneers who traveled the Oregon trail as children to new homes in the Northwest. 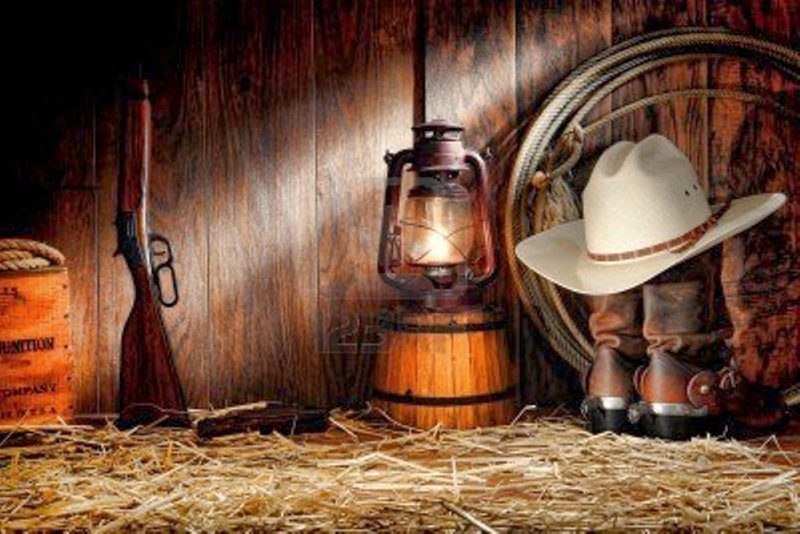 Several accounts, including Virginia Holmgren's 1964 history, Chinese Pheasants, Oregon Pioneers, make a direct connection between the Dennys' pioneering spirit and desire to improve the land they settled and their decision to introduce the pheasant pioneers to the new world. Gertrude Hall's childhood pioneer experience was particularly dramatic. As a 10-year-old who had just crossed the continent by wagon train, she was staying at the Waiilatpu mission at the time of the attack that became known as the Whitman Massacre. Gertrude's father, Peter D. Hall, is listed among the 14 killed, although his precise fate remains a mystery. He escaped from the mission and made it to the Hudson's Bay Company's Fort Walla Walla, but was denied entry and never seen again. Gertrude and her mother and four sisters, like most of the women and children, were unharmed but held captive for a month before being ransomed. By the time of her death 86 years later, Gertrude Hall Denny was the final survivor of the Whitman Massacre. Owen Denny was born in Ohio and traveled west with his family in 1852, the year he turned 14. There is no indication that his family was related to the Denny family from Illinois that landed at Alki one year earlier, helping found the city of Seattle. Owen's father died soon after his family reached the Willamette Valley, and his mother took a land claim near Lebanon in Linn County, Oregon. Owen worked his way through school and "read law" with practicing lawyers. After passing the state bar exam in 1862, he was a prosecutor and then a judge in The Dalles. Owen Denny and Gertrude Jane Hall White married in 1868 -- Gertrude was amicably divorced from her first husband, Columbia River pilot Captain Leonard White, and had a 12-year-old daughter. The Dennys lived briefly in California and then settled in Portland, where Owen was elected police court judge and later worked as Collector of Internal Revenue. In 1877, Denny was named United States consul in Tientsin, China. After three years in Tientsin, the Dennys moved to Shanghai in 1880 when Owen was promoted to the post of consul general. By that summer, they were considering an attempt to introduce to Oregon some of the exotic birds and plants they had encountered in China. The ring-necked pheasant, a large dramatically colored wild bird that frequented the farms and fields around Shanghai, was one choice. Owen Denny wrote to a friend, "These birds are delicious eating and very game and will furnish fine sport". "The Chinese farmers ... take them with nets and market them alive, but the fact that they were often poor and thin induced me to purchase them by the dozen and feed them until they were fat and fit for my table. On one occasion I had in my enclosure a large number of extraordinarily handsome birds, and while admiring them I thought, What would I not give to be able to turn the entire lot adrift in Oregon? Then and there the resolve was made". In January 1881, the Dennys loaded some 60 ring-necked pheasants aboard the Otago, a Port Townsend-based ship commanded by Captain Royal. Their shipment included smaller numbers of Mongolian sand grouse and chefoo partridges, "16 trees of the Pang Tao or flat peach," and "a lot of bamboos". The ship Otago reached Port Townsend on Sunday, March 13, 1881. "The birds were kept in the hold and withstood the trip well. Only a few died; however, in bringing them from Port Townsend to Portland they fared badly. While in the dark vessel they were quiet and unfrightened, but when in train and boats, rattling and splashing scared the birds, which beat and bruised themselves on the bars". A. H. Morgan, a friend of the Dennys, released the few surviving ring-necks on Sauvie Island in the Columbia River near Portland. Although later accounts suggest that these first pheasants did not establish a breeding population, in 1888 there was a U.S. Agriculture Department report which stated the pheasants released in 1881 "wintered well, and have been increasing ever since. They are now common". The grouse and partridge on the other hand did not survive, but the bamboo shipment was a success. Well, maybe because they simply did not know how the first pheasants were doing or they may had doubts that all were still alive, either way the Dennys made a second effort in 1882 and a third effort in 1884 to send more ring-necked pheasants and other Chinese birds -- but directly to Portland. Owen's brother John Denny released those ring-necks near the family's Willamette Valley homestead in Linn County, and this time the introduction was a clear success. Within a year, ring-necked pheasants had spread to surrounding counties. Owen Denny used his political connections to win passage of state legislation banning hunting until the population was sufficiently established. The pheasants thrived and when the first pheasant season opened in Oregon 11 years later in 1892, hunters reportedly bagged 50,000 birds on the first day. By then, or soon there after, ring-necked pheasants had spread into Washington state. In addition, birds from a third shipment, which the Dennys brought with them when they returned from China in 1884, were released on Protection Island, not far from Port Townsend where the first pheasants had landed three years earlier. ﻿﻿﻿﻿﻿﻿﻿﻿ The ring-necks flourished on the island and apparently succeeded in crossing the Strait of Juan de Fuca to colonize Vancouver island. Following their success in the Northwest, ring-necked pheasants were introduced across the country, many of them descendants of the birds Denny sent to Washington and Oregon. At least 19 states now have sizable pheasant populations. 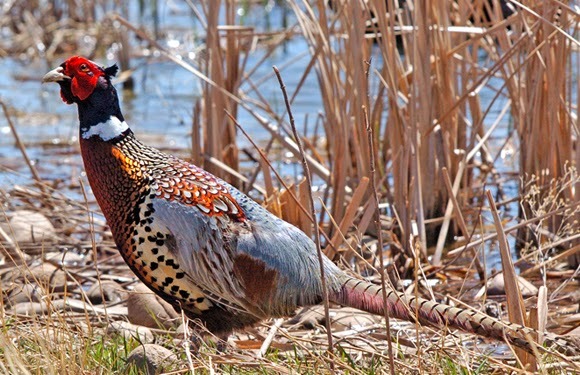 South Dakota, which has millions, has made the ring-necked pheasant its state bird. And frankly, for good reason since South Dakota brings in millions of dollars each year during Pheasant Hunting season. For a time after their introduction the pheasants from Shanghai were often referred to, especially in Oregon, as "Denny pheasants" or as "China pheasants." While the moniker honoring the Dennys did not stick, the Dennys are still recognized for their role in making the dramatic sight of ring-necked pheasants common across America. Pheasants are birds that can be found alone or in small flocks. Males have shimmering gold and green plumage on the back, an iridescent dark-green neck above a dramatic white collar ring, red eye wattles, ear-like feather tufts, and a long sword-like tail. These roosters typically have a harem of several females during spring mating season. Females are a more subdued brown and black but also have the distinctive pointed tail. Hen pheasants nest on the ground, producing a clutch of around ten eggs over a two to three week period in April to June. The incubation period is about 23–26 days. Typically, a mother hen and her flock will stay together until early autumn. While pheasants are able to fly fast for short distances, they prefer to run. If startled however, they will burst to the sky in a "flush." Their flight speed is 27 to 38 mph when cruising but when chased they can fly up to 60 mph. Pheasants spend almost their entire life on the ground, rarely ever being seen in trees. They eat a wide variety of foods including, insects, seeds and leaves. It is interesting to note that while pheasants thrive in a farmland landscape with ample undisturbed grassland habitat. Pheasant populations increased and reached all time highs in the mid-1900s before suffering severe population declines. All in all, since the 1960s, changes in agriculture has lead to a decline in pheasant numbers. Fact is, just as in most parts of the country, changes in farming practices have greatly reduced grassy fields, corners, and fence rows. And yes, advances in seed genetics nearly eliminate weeds and allow crops to be planted closer together. And while farming and the changing landscape of America means less habitat for pheasants, the change is weather patterns is also a major factor influencing pheasant numbers. Cold, snowy winter reduce marginal habitats and concentrate pheasants and their predators. This means by spring, much of the nesting habitat is reduced to road ditches, terraces and grassed water ways, where spring rains flood nests -- and in many cases drown chicks. The future for pheasants, and subsequently the millions of dollars spent in states by way of pheasant hunting, just may be in the hands of farmers and ranchers. Since most farmland and ranches are private property, if pheasants are to survive and be there to hunt and harvest in the future, then maybe landowners may have to be compensated somehow to keep at least some of their properties as "wildlife habitats". Farming and ranching is tough enough to do such a thing as give up their land as "wildlife habitats" without some sort of compensation, it just would be fair to do so. And in the mean while, when you and your dog are out this pheasant season, give a small thanks to Owen and Gertrude Denny for making it all possible in the first place. This article was compiled from multiple sources.